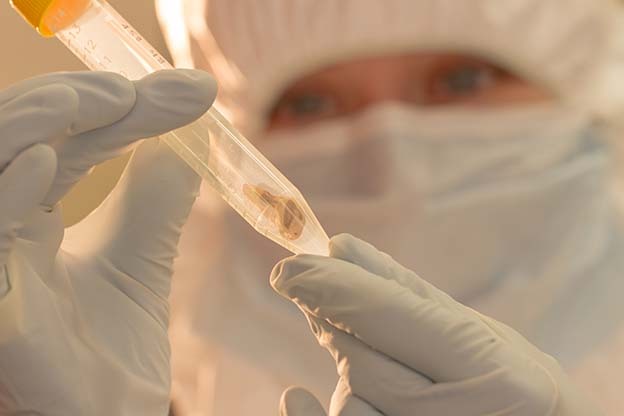 Biology graduate student Jennifer Klunk examines 1500-year-old teeth, from which scientists were able to extract Justinian plague DNA fragments. An international team of scientists has discovered that two of the world’s most devastating plagues – the plague of Justinian and the Black Death, each responsible for killing as many as half the people in Europe—were caused by distinct strains of the same pathogen, one that faded out on its own, the other leading to worldwide spread and re-emergence in the late 1800s. These findings suggest a new strain of plague could emerge again in humans in the future. “The research is both fascinating and perplexing, it generates new questions which need to be explored, for example why did this pandemic, which killed somewhere between 50 and 100 million people die out?” questions Hendrik Poinar, associate professor and director of the McMaster Ancient DNA Centre and an investigator with the Michael G. DeGroote Institute for Infectious Disease Research. Should scientists working with samples of the plague be worried about getting sick? Not at all, says biology grad student Jennifer Klunk. In fact, the real worry is scientists contaminating samples of the pathogen with their own DNA – hence the special garb Klunk wears in the lab. The Plague of Justinian struck in the sixth century and is estimated to have killed between 30 and 50 million people — virtually half the world’s population as it spread across Asia, North Africa, Arabia and Europe. The Black Death would strike some 800 years later with similar force, killing 50 million Europeans between just 1347 and 1351 alone. Using sophisticated methods, researchers from many universities including McMaster University, Northern Arizona University and the University of Sydney, isolated minuscule DNA fragments from the 1500-year-old teeth of two victims of the Justinian plague, buried in Bavaria, Germany. These are the oldest pathogen genomes obtained to date. The results are currently published in the online edition of The Lancet Infectious Disease. They show the strain responsible for the Justinian outbreak was an evolutionary ‘dead-end’ and distinct from strains involved later in the Black Death and other plague pandemics that would follow. 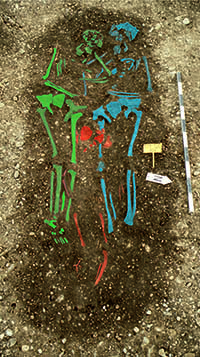 The remains of a family buried in a Bavarian plague pit. The skeletons have been artificially dyed for easier identification. Researchers now believe the Justinian Y. pestis strain originated in Asia, not in Africa as originally thought. But they could not establish a ‘molecular clock’ so its evolutionary time-scale remains elusive. This suggests that earlier epidemics, such as the Plague of Athens (430 BC) and the Antonine Plague (165 -180 AD), could also be separate, independent emergences of related Y. pestis strains into humans. “The tick of the plague bacteria molecular clock is highly erratic. Determining why is an important goal for future research” says Edward Holmes, an NHMRC Australia Fellow at the University of Sydney. “This study raises intriguing questions about why a pathogen that was both so successful and so deadly died out. One testable possibility is that human populations evolved to become less susceptible,” says Holmes. “Another possibility is that changes in the climate became less suitable for the plague bacterium to survive in the wild,” says Wagner. The research was funded in part by the Social Sciences and Humanities Research Council of Canada, Canada Research Chairs Program, U.S. Department of Homeland Security, U.S. National Institutes of Health and the Australian National Health and Medical Research Council.